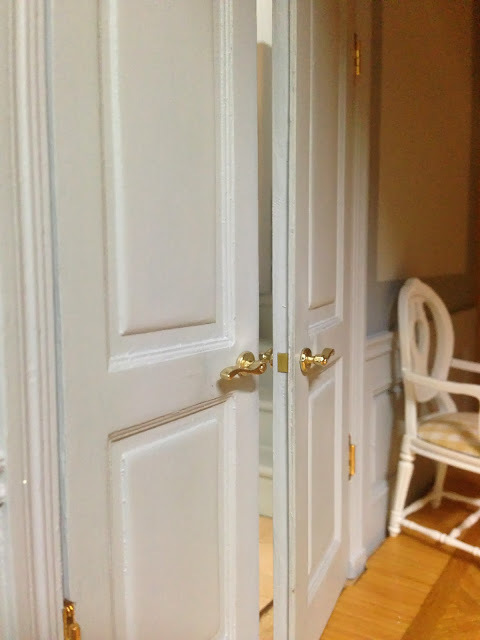 Preparing and hanging doors is a tricky business. To get a real aged look you have to create wear and tear. 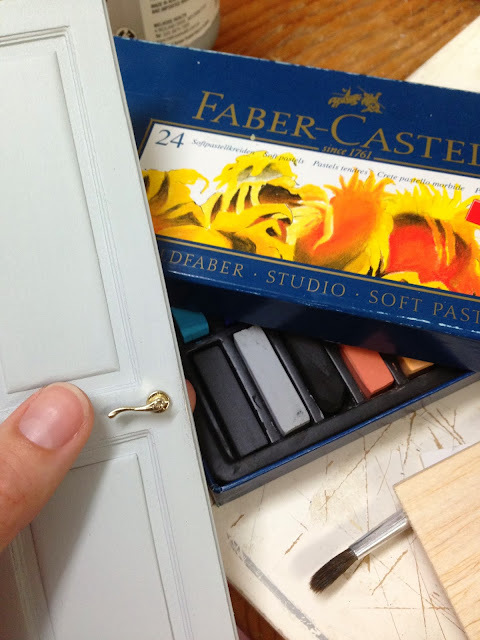 Lightly sand the surface and then smudge it very lightly with grey chalk pastel. 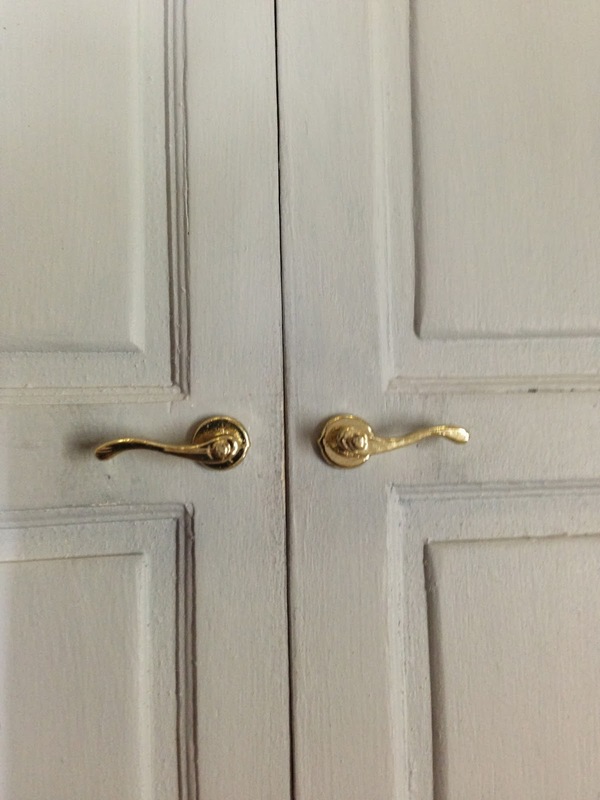 Be sure to smudge only where ordinary wear and tear would be, such as around the door handle. 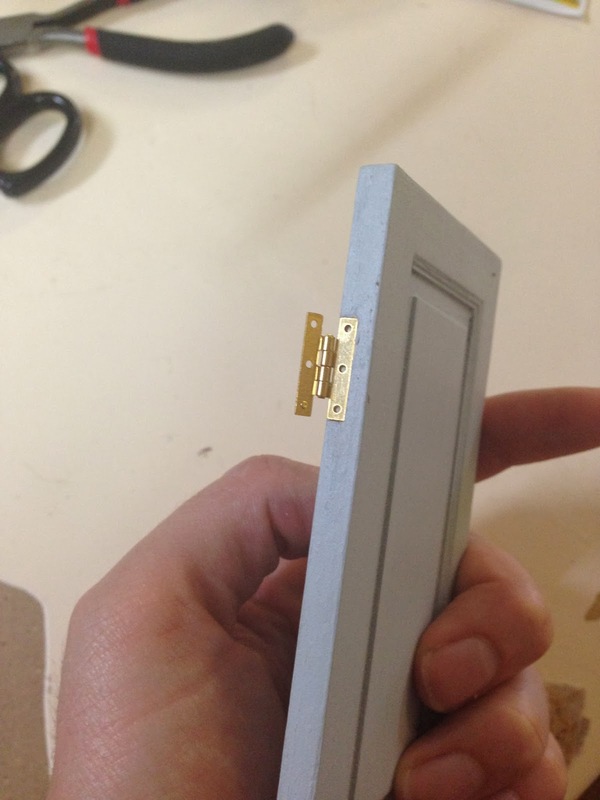 To add more realism I made a faux door catch by cutting an indent on one door (above) and gluing a small brass square on the other (below). 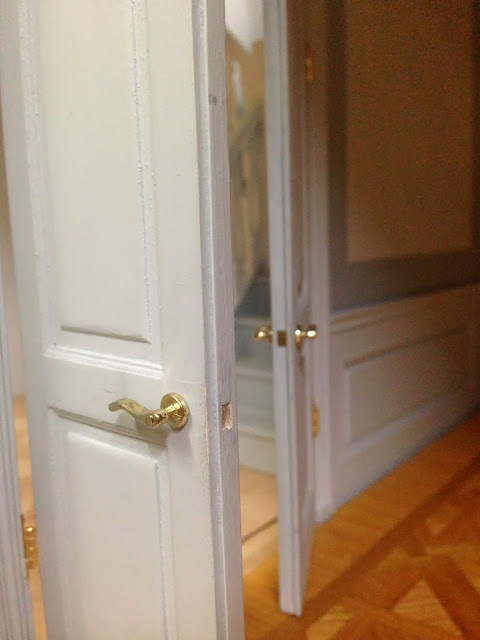 I hung the door using hinges rather than using a pin (which is easier). 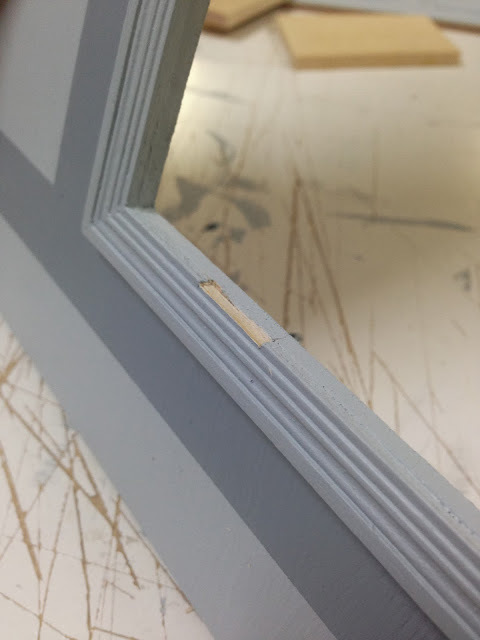 This required carefully cutting in where the hinges will go. 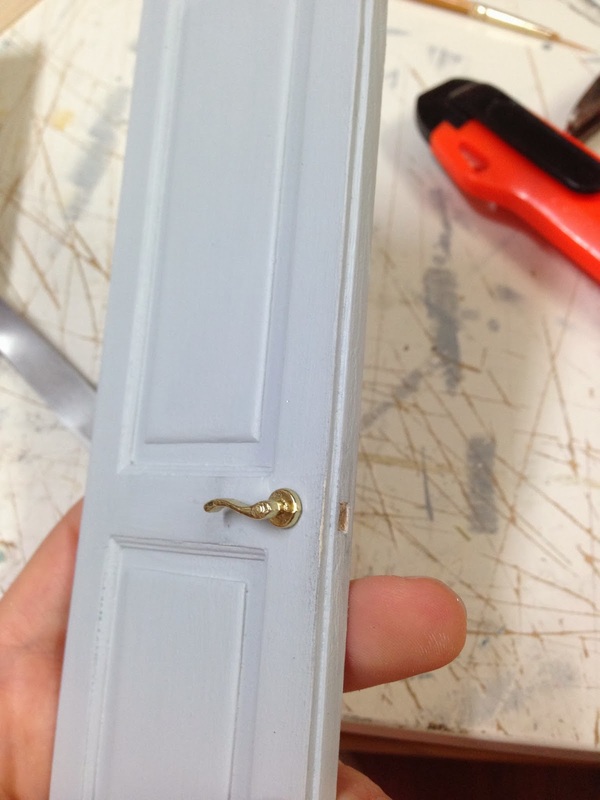 I superglued the hinges on, and then drilled little holes for the nails. This makes it much easier than trying to nail it when it is not fixed in place. 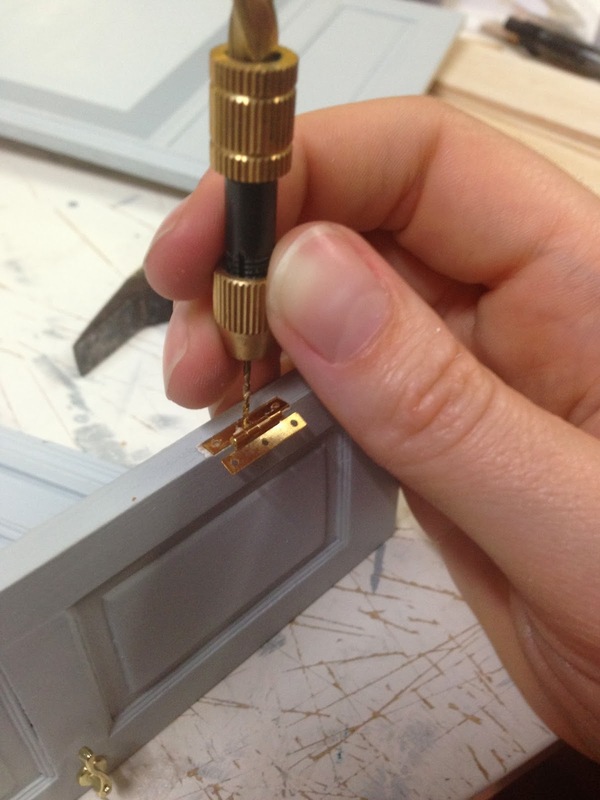 Also, be sure to drill the holes and glue in the nails rather than nailing them in with a hammer. 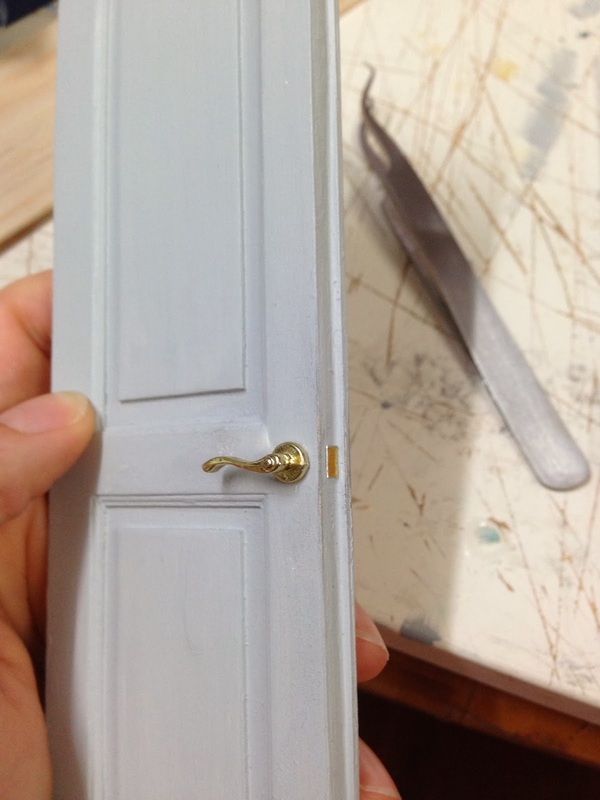 If you nail them in the chances are the delicate wood of your door will split. It is important to ensure your hinges are perfectly lined up and horizontal, otherwise the door will not open or the hinges will break when you open it. I am going to be getting a new little kitten next week, and so have been planning and collecting supplies for her arrival. Despite extensive searches I couldn't find a cat bed I liked. They all seem to look like giant bean bag chunky things with bad/ugly fabric. As such I decided to create my own. I had a pile of card board outside and decided to recycle it. I wanted to use my miniature skillz to create an architecturally correct cat house which is a good hidey-hole for puss but also looks novelty. 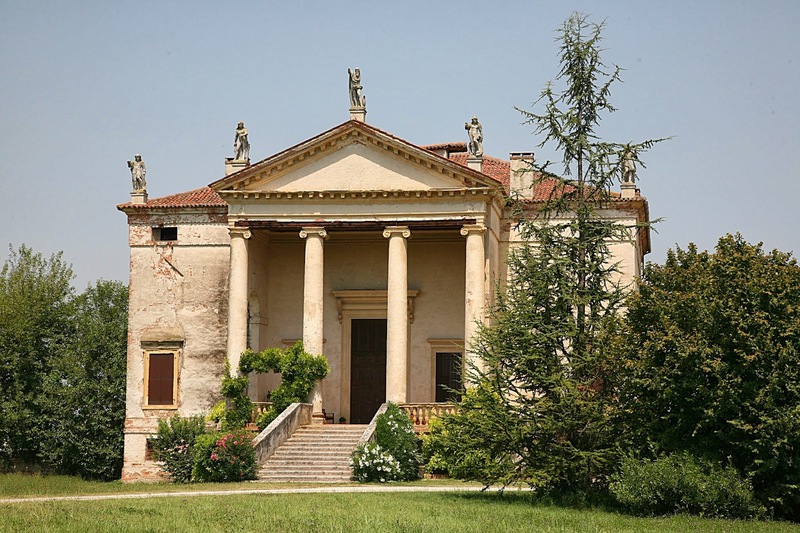 I am particularly enamoured of the great neo-classical architecture of Palladio. Especially the Villa Chiericati. I decided to copy it in miniature. The cat house measures 38cm square. There is circular door in the back of the house for puss to enter. I decided to replace the Palladian statuettes with neo-classical cats. It looks surprisingly inconspicuous in the lounge room. Today some little throw pillows I ordered arrived. I ordered them from Annina at Miniatures by Annina on Etsy. They look lovely. Because she has filled them with a type of sand rather than stuffing, they have a more realistic look. It is now summer in Melbourne, and today the temperature reached 36 degrees (97 degrees F). Because of this when I came home my little shelf had fallen off the wall because the blu-tack had melted! Such hot weather always makes me feel like Christmas will soon be here (Yay! ).